Two of my friends work at a Affirm — an online consumer loan company that aims to one day be the future bank. Founded by one of the Paypal Mafia, Max Levchin, Affirm allows everyday consumers to finance large purchases into smaller, more manageable chunks. For example, if I wanted to buy a pair of really nice leather boots for $300 but simply don’t have the money, I can go to Affirm and split this purchase into a 3 month, a 6 month, or a 12 month payment plan. Boom, I can suddenly afford my amazing new boots and Affirm now can gain a little from interest! Anything dealing with payments and finance is already hairy and impressive. Affirm seems to take this a step further because they are trying to revolutionize and directly compete against incumbent banks without the advantage of a capitol base. Let’s take a step back and understand the business model. 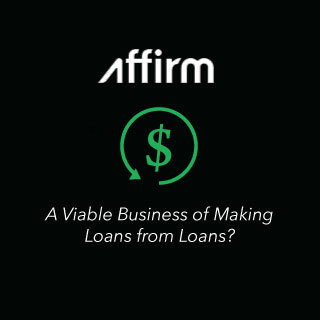 Affirm makes money from giving loans to consumers. Then, within 3, 6, or 12 months, they will either get the money back and some, or they will lose their entire investment (loan). They believe their competitive advantage against incumbents is they are not using FICO, one of the older, more established credit scores. FICO uses systematic indicators such as mortgage payments and history, but Affirm believes that those numbers are kind of bogus. So they are attempting to reinvent it. This means that Affirm could potentially give loans to a huge market that banks will not touch. Affirm needs to eliminate fraud — these are the malicious, bogus, and evil tricksters who want to take money and never pay back. Affirm also needs to iron out their indicators for understanding an unreliable candidate (the Joe Smo that really, really wants those boots, but is actually a total bum, cannot actually hold a job because he’s a lazy fart, and seriously should NOT be trusted to take out a loan). Now — what I find really impressive is that Affirm doesn’t have the base of consumers gladly pouring in money into Affirm for safekeeping (and to create loans!). This means that Affirm lends out money… by loaning money from the banks themselves! When I cash my paycheck at Wells Fargo, I’m doing this b/c I don’t wan’t wads of cash floating around in my room. Also, Wells Fargo insures up to I believe $200K, so I feel like Wells Fargo, with it’s armed guards and metal doors, can probably do a better job of protecting my hard earned moolah. As an added bonus, I can maybe get about .01% interest, which, hey is not bad. The excellent part is I can now take that Wells Fargo money and turn it into some better investments, like into several shares of ownership of their competitor, JPMorgan Chase (which has been doing very well, you go JPM). Wells Fargo, in turn, takes my money, and can lend this out to other folks with a fat 5-10% interest (or whatever). Essentially, I fronted over a loan to Wells Fargo for .01% interest, and they pack in a really nice spread of 4.99%-9.99% interest. Nicely done, Wells Fargo! To get this dirt-cheap consumer money, they have pay for the consumer banks presence, hire some bank tellers, and maybe buy a few couches so the banking experience is nice. I’m simplifying this considerably, because consumer-banking is a huge expense. Affirm does not pay for this. Instead, Affirm probably takes a 3-5% loan (lower than for consumers because of their reputation and economies of scale) from Wells Fargo as the base. Item Affirm Incumbant Banks (any commercial bank) Competitive Advantage for Affirm? Damn. That seems expensive. Talk about moneyception. If done right, though, they will be able to enter a new market and skim off a layer of interest that the banks were unwilling to previously touch. If done wrong, they will crash and burn in a sad pit of default. Let’s talk some quick numbers. Affirm has about 50 employees. If we assume a flat $200,000 / employee (it might even out given really expensive engineers, certain perks, costs of buildings, lawyers, whatever), we are talking about $10,000,000 of expenses per year. If the average loan is $200, and the average interest is 6%, this is $12 of profit on top. To break-even from a simple cost-basis, we need at least 850K fully-returned-non-defaulting loans in this year. With $200 per loan, this is a capitol base of about $166MILLION DOLLARS. That’s some moolah right there. I, however, did not factor in the (i) the cost of the loan from the banks (ii) evil, tricksy, fraudsters and (iii) the irresponsible Joe Smos that can’t hold a job and won’t be able to pay Affirm back. If we factor in (i), we could maybe say that the interest rate drops to 5% resulting in an average of $10 profit and increasing the necessary capitol base to a lovely $200 million. (ii) and (iii) are slightly different beasts, assuming the N number of loans reaches a high enough volume, the algorithms will likely stabilize around a steady-state %. Once the default rate stabilizes (and of course, Affirm’s crack team of data science folks will constantly strive to reduce this number, but may have difficulty b/c the world is, fortunately or unfortunately, stochastic), this will require that the interest earned will always be greater than amount defaulted. Ignoring labor costs and charging a 5% net interest (factoring in the loan to the bank in the first place), total default rates MUST be lower than 4.76%. Period. If it’s higher, the company will miserably default. If they can’t figure out a way to reduce this, I can’t see how the numbers could ever make sense, since Affirm’s policy is that they ail never issue late-fees or tack-on-interest (from what my friend told me). And no, silly person, government-bail-outs don’t count! Is this how OpenDoor will operate? I would imagine the back-end mechanisms are similar to OpenDoor’s business model. OpenDoor wants to enable any home-owner to immediately sell their home. WIthout getting too much into OpenDoor (and I will, later), I would imagine that OpenDoor will need to finance these 90-day purchases via similar loans. The difference is, however, that OpenDoor’s profit depends not on the interest rate, but a future selling price. The capitol base will depend not on the amount originally loaned out, but the purchase. These are both way squishier than the originating loan base and future promised value. OpenDoor, instead of holding onto a promise of a loan, will likely receive ownership of the asset itself. And, like the banks all said in years leading to the real-estate induced 2008 collapse, a house has little chance of depreciating, right? Putting the nay-saying aside, the incentives of selling a house is far different from a predatory home equity loan, and as you can tell, I’m massively excited to discuss this further!